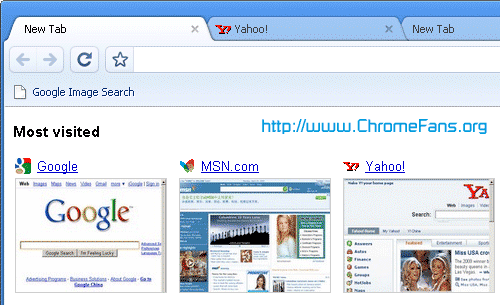 Google Chrome shows the thumbnails of the visited web pages from the new tab page. However, many peoples want to remove the thumbnail images for the privacy reason. There is a good news: Google Chrome's Dev channel has been updated to 2.0.174.0 in April 16, 2009, it supports for removing thumbnails from the New Tab Page (feature still in development). ACA HTML to Image Converter: make thumbnails from web pages in batch - Save the HTML web pages to JPEG/GIF/PNG/TIF/BMP images. Previous article: Official Google Chrome on Mac OS X: Coming soon!